In a blue post on the Blizzard forums (see "(Sticky) Transmogrification Rules") Community Manager Kaivax took time to give further clarifications on the rules for transmogrification. For those of us who are excited about the possibilities of transmogrification and have been running old content and/or collecting gear these rules could be a big help. We don't waste time getting gear that ultimately won't be usable for mogging (*cough* Dark Herring *cough*). Head after the jump where we provide all the rules as well as give our thoughts. • The character must be able to equip both items. • Guns, Crossbows, and Bows can be used to transmogrify Guns, Crossbows, or Bows. • Main hand weapons can only be used to transmogrify Main hand weapons. • Off-hand weapons can only be used to transmogrify Off-hand weapons. • One handed weapons can be used to transmogrify a Main hand or Off-hand weapon. • Using an item for transmogrify makes it soulbound. • Using an item for transmogrify makes it non-refundable. • Using an item for transmogrify makes it non-tradable. • Heirlooms and Account Bound items can be transmogrified. 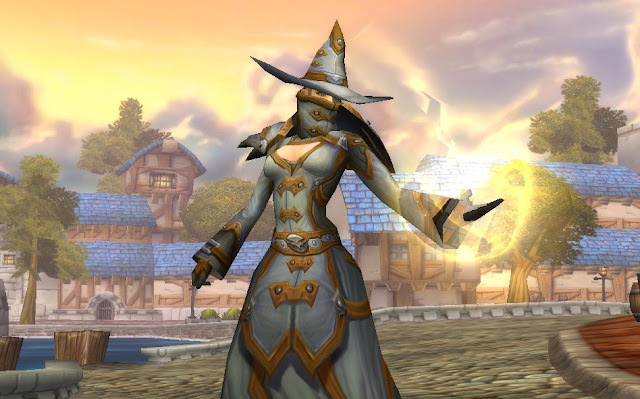 • Heirlooms and Account Bound items can be used to transmogrify. • Legendary items cannot be transmogrified. • Legendary items cannot be used to transmogrify. • Fishing Poles cannot be transmogrified. • Fishing Poles cannot be used to transmogrify. • Mailing an item strips its transmogrification. • Placing an item in Void Storage strips its transmogrification. • Vendoring an item strips its transmogrification. • The displayed enchant will be that of the currently equipped item. Further down in the thread Kaivax makes a few more clarifications. Lohida: I've heard people claiming you can only do weapons to another weapon of the same stats type. Like only spellpower swords to spellpower swords and AGI swords to AGI swords. Is that a restriction or no? Kaivax: At this time, that is not a restriction at all. All in all nothing too surprising. Glad to have some clarifications on one-handed/main hand/off hand weapons. While I am a little disappointed I won't be able to dual wield Sun Eater's it makes me happy that any one-handed weapon I own can always be used to mog my dual-wielder's weapons regardless if they are main hand/off hand or one-handed. My rogue is especially happy about this. It is also is nice that we will be able to use heirloom items *to* mog with. Some of the older set items are quite iconic (I love the look of the cloth heirloom headpiece.) I think the mail intellect heirloom set might be quite popular with shaman. Reading these guidelines make me even more excited for patch 4.3 and transmogrification. 4.3 can't come soon enough.